The Leap Blog: Are the inflationary fires subsiding? Keeping in view the domestic demand-supply balance, the global trends in commodity prices and the likely demand scenario, the baseline projection for WPI inflation for March 2012 is kept unchanged at 7 per cent. Elevated inflationary pressures are expected to ease from December 2011, though uncertainties about sudden adverse developments remain. Inflation is broad-based and above the comfort level of the Reserve Bank. Further, these levels are expected to persist for two more months. ... However, reassuringly, momentum indicators, particularly the de-seasonalised quarter-on-quarter headline and core inflation measures indicate moderation, consistent with the projection that inflation will begin to decline beginning December 2011. The projected inflation trajectory indicates that the inflation rate will begin falling in December 2011 (January 2012 release) and then continue down a steady path to 7 per cent by March 2012. It is expected to moderate further in the first half of 2012-13. This reflects a combination of commodity price movements and the cumulative impact of monetary tightening. Further, moderating inflation rates are likely to impact expectations favourably. These expected outcomes provide some room for monetary policy to address growth risks in the short run. With this in mind, notwithstanding current rates of inflation persisting till November (December release), the likelihood of a rate action in the December mid-quarter review is relatively low. Beyond that, if the inflation trajectory conforms to projections, further rate hikes may not be warranted. WPI inflation is not interesting in thinking about monetary policy. The WPI basket is not consumed by any household. The right measure of inflation that all of us should focus on is the CPI. 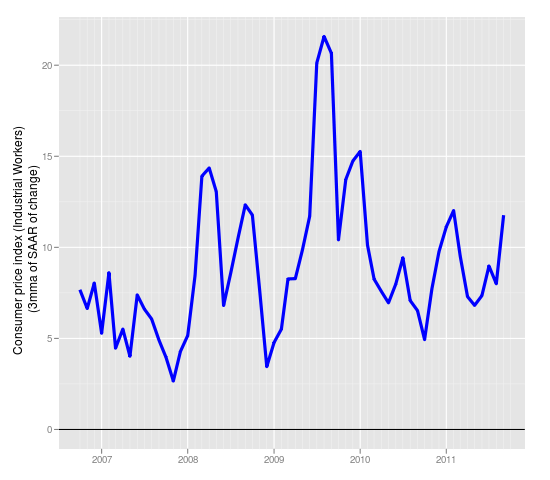 We just released an updated batch of seasonally adjusted data, and the news for inflation, for September 2011, is bad. CPI-IW grew at an annualised (seasonally adjusted) rate of 20.15% in September 2011. As a consequence, the 3-month moving average inflation went up from 8% in August to 11.77% in September. If we compute the policy rate as the halfway mark (8%) and subtract out this latest value of the 3-month moving average inflation rate (11.77%), the policy rate expressed in real terms is -377 basis points. The key fact about India's inflation crisis is: "Headline inflation", which I would define as the year-on-year rise of CPI-IW, has been outside the target range of 4-5 percent in every single month from February 2006 onwards. High inflationary expectations have now set in. Given what is happening on prices of both tradeables and non-tradeables, I find myself skeptical about the sanguine picture on inflation that was painted on 25 October. The bottom line: Headline inflation (year-on-year rise of CPI-IW) went up from 8.99% in August to 10.06% in September. This is inconsistent with a sanguine analysis of inflation on 25 October. Or perhaps the econometricians at RBI have some aces up their sleeves. Will point-on-point seasonally adjusted inflation, under the benign influence of a strongly negative real rate, veer back into the 4-5 per cent range by December 2011? Stay tuned. So far, the score is: September 2011, 20.15%. 1. Did you believe 2 weeks ago that the inflationary fires were going to subside any time soon? 2. If not, why would the data sets the RBI examines allow them to even suggest that a dovish policy would be appropriate? OK, your answer to the 2nd question would be speculative, but your take would be interesting..
On October 26, I did not believe there was a pretty future coming. I kept my peace until the next data point became available. I don't know why RBI chose to hold out the promise of a pleasant world where inflation (which has resisted attack from Feb 2006 onwards) will now make nice and go away. Maybe it was a way of gaining political support for doing an unpleasant thing (raising rates by 25 bps). Or, here's another conjecture. Many times, simplistic econometrics leads to thinking where it is felt that time-series are wired to go back to their long-run averages. When you run such things, you become complacent about inflation surges, since the model is saying that it's likely to go back to its long-run mean. Maybe some in RBI are doing such things. RBI needs to talk more about the models that are used in production, so that the broader economy can know (and help improve) how monetary policy is conducted. I feel all central banks should release their main production models (the very models which produce the identical fan charts that go into the inflation report) on their websites, so that everyone in the economy is on the same page, so that models can be criticised, and so that you and I can put alternative assumptions into the models and see where that takes us. Many thanks, Ajay. I agree - wireframes of all models should be posted, so we can speculate how they will look with different clothing, or none! Did you just mention econometrics and RBI in the same post? How can they reveal non-existent models? On 25th Oct I commented on your inflation blog that the realised inflation is more than 15%. From your data-sets, you have also got 20%. RBI' baby steps methodology is behind the curve. No effect!! They have to break high inflation expectation. You point out in your comment that "I feel all central banks should release their main production models (the very models which produce the identical fan charts that go into the inflation report) on their websites, so that everyone in the economy is on the same page, so that models can be criticised, and so that you and I can put alternative assumptions into the models and see where that takes us." This is certainly a very good point. But, if this is known to all 'agents' in the economy, won't their expectations consistently differ from the targeted rate of inflation? Alternatively, if all the 'agents' in the economy think that the model(s) are effective, it could improve credibility of RBI and might help. In any case, transparency is a good feature, I suppose.